Chris Milner on his way to a crucial 47 for Peterborough Town against Oundle. The Oundle wicket-keeper is Alex Martin. Photo: David Lowndes. 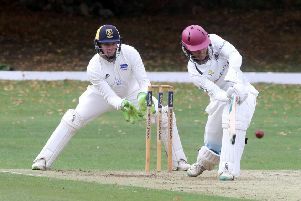 Peterborough Town came back from the dead to keep their Northants Premier Division title challenge on track at the expense of local rivals Oundle yesterday (July 18). The city side’s slump from 49-0 to 74-7 - they actually lost four wickets for one run at one point - appeared to be terminal. Professional Paul McMahon was digging into wedding cake so he wasn’t on hand to help and Oundle’s overseas star Petrus Jeftha was licking his lips at the prospect of feasting on Town’s tail. But wicket-keeper Chris Milner, first with the help of Dan Oldham, and then during an excellent ninth-wicket stand of 68 with quick bowler Jamie Smith saw off Jeftha, and impressive stand-in bowler Cameron Wake, to push his side up to 166 by employing tactics long-abandoned by cricketers at all levels (with the exception of Alistair Cook), of crease occupation and shot selection. Surprisingly Oundle missed their absent stars Bashrat Hussain and Zeeshan Manzoor more than Town missed McMahon. The visitors lacked depth in both batting and bowling as Milner’s 47 proved just as vital as the 10 wickets shared by Town skipper Lewis Bruce and Joe Dawborn. Oundle were dismissed for 122 to complete a 42-run defeat after losing their last five wickets for just 12 runs with Jeftha’s departure for 34 to Bruce the most crucial. It was an absorbing contest, but one devoid of much batting quality. Town blamed a Bretton Gate pitch they described as ‘two-paced’, while Oundle were less than thrilled with the cordial relationship Bruce struck up with the umpire standing at his bowling end. Bruce bowled his off-spin beautifully to return outstanding figures of 6-24 from 12 overs - that’s 11-53 in his last two Premier Division games - with four of his victims falling to lbw decisions. Oundle felt key men Wake and Jeftha were unfortunate to see the finger raised. At the other end Dawborn was his usual fiesty self claiming the first three wickets to fall, including Alex Martin, who started the day top of the top-flight run-scoring charts, for two and returning to dismiss Oundle skipper Phil Adams who was developing a partnership with Jeftha that threatened to win the game. The pace ace with the potty mouth registered figures of 4-43 to make it 42 for the season, the best tally in the division. Oundle will surely have regrets. Town look more vulnerable, certainly with the bat, this summer, but the back-up bowlers lacked penetration so the sterling efforts of Jeftha (4-59) and Wake (4-42) were ultimately rendered meaningless. The latter also took a stunning catch running in from long leg. Town remain second, but have closed the gap to five points on leaders Rushden who were far more impressive in victory than the city side yesterday, but picked up five fewer points. Hopefully those who write these ridiculous rules are taking notes for next season. Bowling: P. Jeftha 15-2-59-4; C. Wake 17-4-42-4; J. Roberts 5-1-17-1; R. Cunningham 9-2-28-0; J. Bolsover 5.4-1-17-0. Bowling: J. Dawborn 15-2-43-4; J. Smith 11-3-30-0; L. Bruce 12.4-6-24-6; K. Jones 5-2-19-0.